View More In Bar Tools & Glasses. Here at Atterstone we pride ourselves on providing the most unique, high quality products. We spend endless hours developing our product offerings to ensure you are receiving the a product that will make you proud to show off! When you purchase from Atterstone, you can be confident that you will receive a true piece of art. Our Barrel Whiskey Decanter Set is truly a work of art. The handblown sail boat feature takes this whiskey decanter set to a new level of elegance. Each unit is handblown and meticulously inspected to ensure the quality of your custom whiskey decanter. The stainless steel dispenser is made from high quality food grade stainless steel to prevent corrosion and ensure the life of your stored spirit. The dispenser also features an adjustable rubber grommet so each dispenser can be custom fit to your handblown Scotch Whiskey Decanter. The included whiskey glasses feature a think glass bottom that feels great in your hand. 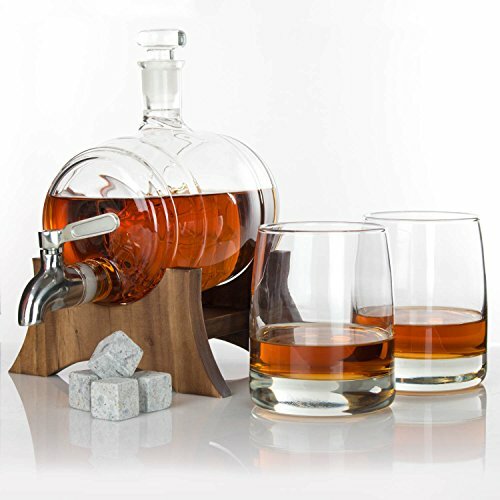 This full Whiskey Decanter Set gives you everything you need to start your mini whiskey bar! This large whiskey decanter has a total capacity of 1000ml. The custom whiskey decanter features a glass fitted stopper to ensure a tight seal over your stored spirit. The custom mahogany decanter stand keeps your decanter safely on display for everyone to see! Upgrade your home bar and purchase your Barrel Decanter Today! UNIQUE DESIGN: This glass whiskey decanter features a custom barrel design with a handblown sail boat that is sure to catch everyones eye at your next cocktail party. FUNCTIONAL, YET ELEGANT: With a 1000ml capacity, this bourbon whiskey decanter set not only looks amazing, but will also fit any bottle of your favorite spirit. COMPACT: This Whiskey Set includes everything you need to start your mini whiskey bar, yet it is keeps everything within a small area. QUALITY: All the decanter sets that Atterstone produces are handblown from our trusted partners. If you have any questions about this product by Atterstone, contact us by completing and submitting the form below. If you are looking for a specif part number, please include it with your message.